PT Artificial Grass Turf Roll 12 Ft wide per LF is a high performance turf formulated to be the best surface for physical therapy, stretching, exercise and floor work. The blend of nylon and polyethylene is a 50/50 combination, which creates the softness of the new generation rubber filled turf. 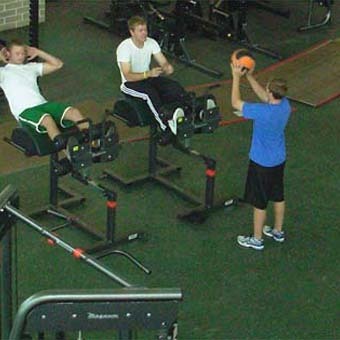 This also makes this a better surface for use with exercise and stability balls. It is an excellent turf for sleds and performance agility applications. Physical therapy is often painful but with PT Turf, there is a higher level of comfort and support than with your standard flooring surface. Therapists and patients alike experience less pain and discomfort in their feet and joints with the added support and cushioning of this physical therapy flooring. PT Turf delivers excellent shock resistance, high durability and superior mechanical strength unlike carpet or other flooring types. Our yarns are some of the toughest in the business and are regularly tested for strength and durability. Use PT Turf for balance and fall prevention. Older adults have higher fall rates; PT Turf will help cushion the fall. The enhanced uniformity of the physical therapy turf eliminates tripping hazards for improved performance for the patient. This artificial turf is ADA compliant. It is wheelchair and walker accessible. Greatmats physical therapy turf has a shock absorbing 5 mm foam cushion underlayment. PT Turf is available in a navy blue color. It has a 3/4 inch pile height. This artificial grass is available in custom cut length rolls that are 12 feet wide. For other turf options, visit our Artificial Turf product page. What will the home gym be used for primarily? If you’re looking for a tough material to protect your concrete or hardwoods from being damaged by free weights or heavy exercise equipment, you may want to look at rubber. Rubber is the traditional flooring for both home and commercial gyms and it is an economical solution for keeping your floors, as well as your equipment, protected. Rubber flooring is heavy. By heavy, I mean REALLY heavy. A square foot of 3/8″ rolled rubber weighs 2.3 lbs. (8mm is slightly less) That means to cover a 10×10 foot area, you’re dealing with a 230 lb roll of rubber. “Well,” you say, “that’s not so bad. A buddy and I could roll that baby out no problem.” And maybe you’re right. But here’s something else to consider: the rolls show up at your front door on the back of a semi-truck. If you get a liftgate included in your shipping costs (something to consider) they will lower the roll of rubber to the ground and drive away leaving you to wrestle it into your workout area. If you don’t get a liftgate, you will have to pull that baby off the truck yourself and that’s a serious endeavor. Another option is interlocking rubber tiles. These come in various sizes (typically 2×2 foot or 3×3 foot) and can be installed without adhesive of any kind. Depending on the type you buy, you can find them at a reasonable price, although generally more expensive than rolled, and they are much easier to handle. Also, the fact that they require no glue makes it easy for you to bring them with you if you decide to move. RUBBER IS NOT WATERPROOF. Many people are under the impression that rubber is like plastic. That it can be submerged indefinitely in a flooded basement and come out unscathed. This is simply not the case. The porous materials of most rubber flooring will absorb water and hold it. Over time, this will break the rubber flooring down to such a degree that the floor is rendered all but useless. If you are considering putting your home gym in a basement that gets mildly damp on occasion, this will probably not be an issue for you and rubber flooring may be your best bet. If you’re considering putting your home gym in a wet basement that floods from time to time, you may be better served with a waterproof option such as plastic, modular floor tiles that allow airflow beneath the tiles for a quicker dry. Do you plan to do aerobic activities in your home gym area? Zumba, P90x, or Insanity? If so, you probably don’t want rubber. Rubber is quite hard and provides little to no fatigue-relief. If you’re looking for a flooring type to keep your teeth from chattering every time you jump up and down, you need something else. I typically suggest foam. Foam flooring is available in various densities and thicknesses. The play mats that kids play cars on and the MMA mats that fighters throw one another around on are not the same. Determining which type of foam product is best for your needs depends on what specifically you’ll be using it for. Unlike rubber, foam is waterproof and can be submerged indefinitely without the foam taking in water and damaging the foam itself. It provides great shock absorption, requires no glues for installation, and it’s lightweight. It can be easily installed wall-to-wall because all you need to cut the interlocking tiles to fit is a straight edge and a utility knife. It doesn’t get much easier than that. However, under some equipment, foam will indent and stay indented for the life of the product. If you can live with that, foam is generally your best bet. It is inexpensive and, because it is so lightweight, is typically fairly cheap to ship. Hopefully, this gives you some insight into what you’re looking for. The easiest and fastest way to get your specific questions answered is to call one of our customer service reps and have a conversation. They say to make money you have to spend money. Patty W. is living proof that this philosophy can work. Patty runs a business from her home teaching exercise and needed a good flooring for her workouts classes. Stay Lock Bump Top Tiles are a relatively new product for us here at Greatmats and we couldn’t be happier with them. Manufactured in the USA, these tiles are a soft PVC that offers impact cushion and fatigue relief while maintaining rugged durability. This exercise flooring is perfect for industrial, ergonomic applications as well. Perfect for aerobic activity, Stay Lock features a unique connection system that holds the floor tiles together tightly and keeps them flat even over concrete or carpeting. Stay Lock tiles need no underlayment to provide a soft, comfortable workout flooring. This is a plus because it saves time and money. The tiles can be easily cut to work around obstructions or uniquely shaped rooms. The tiles require no adhesives so, not only are they simple to install, they can be taken up and brought with you should you decide to relocate. The typical lifespan of this type of flooring is twenty years. So, Patty, would you buy this product again? “Not only am I pleased, but so are the members of my class. I will be buying additional flooring in the near future to cover the entire area and I would recommend this flooring…My original flooring was not doing what I needed it to and it made it very difficult for everyone. So I had to find a solution and the lockable flooring did the trick and increased my business. Would you recommend Greatmats to your friends? Thank you, Patty. 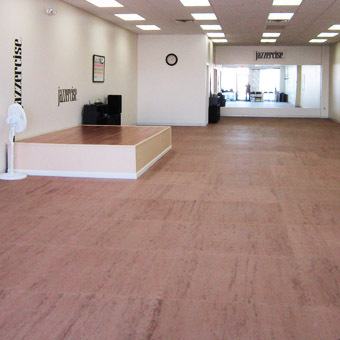 We know that you’ll be happy with your workout flooring for years to come. It is also nice to know that, if something unexpected happens and a tile or two become damaged, you can pop them out and replace them without having to replace the entire floor. Decades from now, when your exercise floor has reached it’s end, it can be reground and made into new tiles! Aerobic Dance Floor interlocking tiles are specifically designed for regular, daily, repetitive usage in commercial athletic facilities. This aerobic flooring is also excellent for Zumba, Jazzercise, and other types of aggressive workouts. These tiles feature a rugged surface texture that will withstand the most punishing commercial aerobic applications. These tiles provide a high quality of commercial-grade surface durability. This flooring consists of high density EVA foam material combined with rubber content. This material compound creates a very durable surface texture that is lightweight and durable. The commercial-grade surface texture is designed to last for many years of commercial use with athletic footwear. Assembling this aerobic flooring is simple. 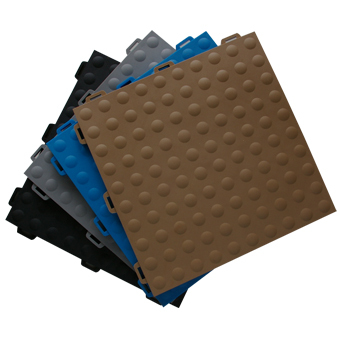 These interlocking foam tiles lock together tightly and with ease. Put your floor together like a giant puzzle. Edges are easily cut with a straightedge and utility knife for perfect wall-to-wall installation every time. Once interlocked, the tiles will stay in place and lay flat. You will not have to worry about your floor “rolling” or shifting around. Because no adhesive is required for installation, these tiles are a fantastic choice for temporary or non-permanent installations such as a leased studio. Your exercise floor can be easily installed or uninstalled and transported. Choose between a wood grain look or marble appearance to compliment your exercise studio.